The Kadar Asmal Fellowship aims to contribute to addressing the skills shortage in South Africa particularly among members of disadvantaged communities. It does this through the provision of one year post-graduate studies in Ireland. 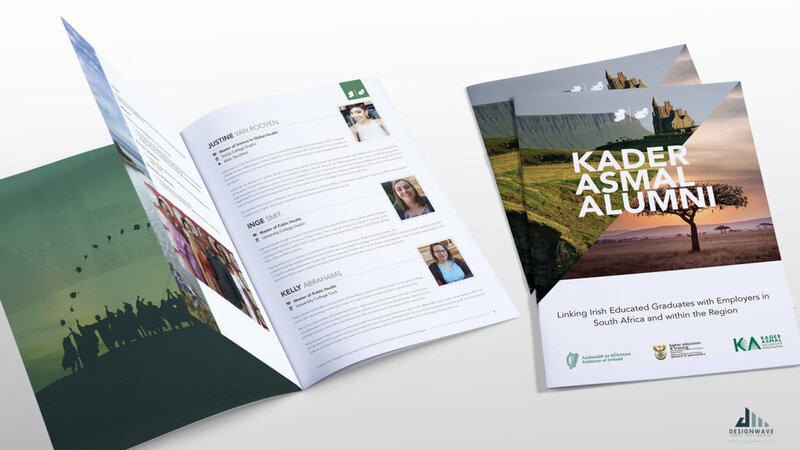 Designwave worked together with the Embassy of Ireland and the KAA to create the foundation for an annual booklet that connects Kader Asmal Alumni members to career and entrepreneurial opportunities, promotes Ireland as a study destination and facilitates community outreach and upliftment activities in South Africa. This project included designing a visual theme for the book, managing content, proofreading and copy editing as well layout, print management and printing services.